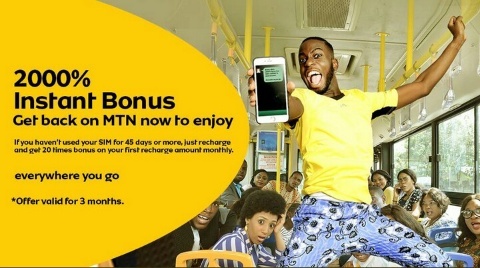 MTN Nigeria is giving all their old customers 2000% bonus when they recharge #100 or more. This promo is a called Welcome Back Offer and it is designed for all old subscribers who haven't used their line for the past 45 days. If you have an MTN SIM that you haven't used for the past 45 days - Quickly go and get them. * N100 recharge will give you N2000 – N500 is allocated for calls and N1500 for data. To check the bonus, dial *559*65#. Please note that the offer is only valid for 3 months and you can only get the bonus once on a SIM.